Finding the right academic journal is central to preventing the common mistake of editorial rejection of manuscripts, prior to peer review. The Springer Journal Suggester is an academic research tool that enables users to select the best-suited journal for their research. The automated process can enable journal selection from a database of over 2,600 Springer publications. The web-based semantics technology refines a list of relevant journals, based on inputs of manuscript title, abstract, and publishing model. The personalized recommendation process will search Springer and BioMed Central to find the best publication that suits the author’s choice. A refined list of potential journals can thereby assist authors to delineate a core publication for their final manuscript submission. The web-based Journal Suggester is easily accessible, requiring only an abstract/description of the unpublished manuscript to find matching journals. When manually selecting the right journal for manuscript submission, stepwise instructions below, via Springer and BioMed Central can offer general guidance. Conversely, the online Journal Suggester automatically considers the same key points, during the process of personalized recommendations. Choosing the theme: Focus on the research discipline best suited for the unpublished manuscript. Consider the best fit of the study within research models of—applied science, clinical research, basic research, or translational research. Browse a list of journals by subject area. Choosing the audience: Consider the target audience. Choose a specialized journal or a broader publication covering a range of topics for accessibility of the study outlined. Type of article: Ensure the possibility of publishing the article in your journal of choice. Depending on the study and journal publication guidelines, submit the manuscript as an original research article, a review, or a case study. Impact Factor: This is not a key requisite for publication. However, enquire about the metrics as a measure of the journal’s reputation, in alignment with the quality of your impending publication. View (choice of all journals, fully open access journals only, or subscription journals). For transparency, the entire database of Springer Open Access journals scanned during the automated refining process is also available online. 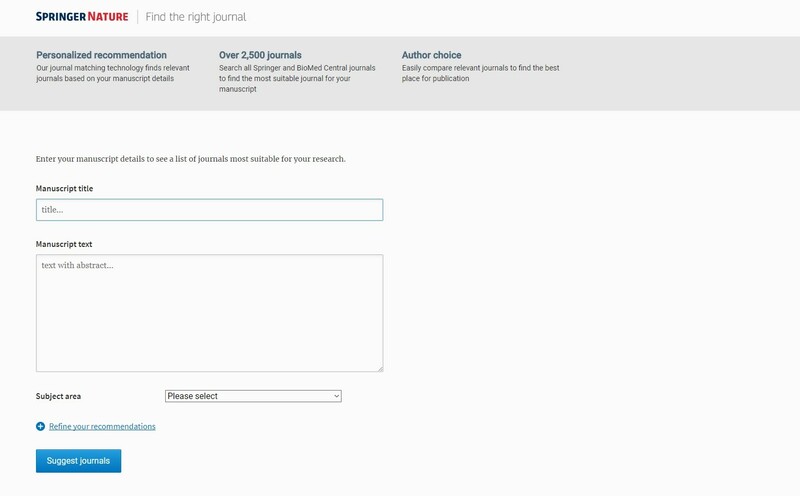 Manuscript preparation: Select a journal of your first choice from the refined list provided via Journal Suggester. Follow journal-specific guidelines on content style and the submission process—detailed as “Instructions for Authors”, on the individual journal’s homepage. i) Ask a native English-speaking colleague to review your manuscript for clarity. ii) Visit the English language tutorial designed to assist non-native English speaking scientists. iii) Use a professional language editing service to help you refine your manuscript. Referencing style: Depending on the discipline refined via Journal Suggester, select the referencing style of your Springer journal of choice. Sample referencing styles are within your journal’s “Instructions for Authors”. Springer also provides output styles supporting the formats of both EndNote and LaTeX. Artwork: For Springer publications, all of your artwork requires submission in an electronic format. Next, the publication will meticulously produce the artwork to the highest standards, while directly reflecting its quality as provided. CrossCheck: The shortlisted Springer journal will crosscheck your manuscript for plagiarism detection and ensure originality of content. eSupplementary: It is possible to publish further dimensions of the article as electronic supplementary materials (animations, movies, audio, etc.). Springer accepts electronic files for publication in the online version only. Springer journals conveniently present a list of Springer Videos for user-friendly assistance on its online platform and on journal selection. When Journal Suggester provides a list of target journals, SpringerLink journal tutorials can guide the selection of your final choice. Automation offers a fast-track process for busy scientists to select a journal best suited for their research with ease. If you are keen to publish fast, Journal Suggester provides the option of deciding the ‘maximum time to first decision’. To strengthen your readership, it is possible to select open access exclusively during the journal refining process. After choosing the journal of interest, it is beneficial to identify a second and third choice of interest as well. This provides a broader range of alternatives for consideration should the first attempt at publication fail. This automation process of Journal Suggester is beneficial overall for fast-paced and cutting-edge research publications. 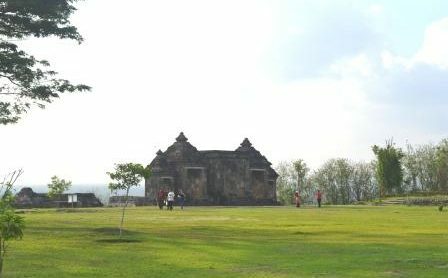 However, the portal’s limitations would be its influence on broader research; for example, additional experiments could increase the publication’s research impact. Furthermore, the manual process of browsing journals may provide you first-hand experience on relevant journals, albeit time-consumingly. The expected outcome of the automated Journal Suggester is to minimize editorial rejection of manuscripts prior to peer review. Overall, the benefits of this web-based academic research tool appear to outweigh its potential limitations. Recently, Enago Academy launched Open Access Journal Finder (OAJF) that aims at enabling research scholars to find open access journals relevant to their manuscript. OAJF uses a validated journal index provided by Directory of Open Access Journals (DOAJ) – the most trusted non-predatory open access journal directory in its search results. 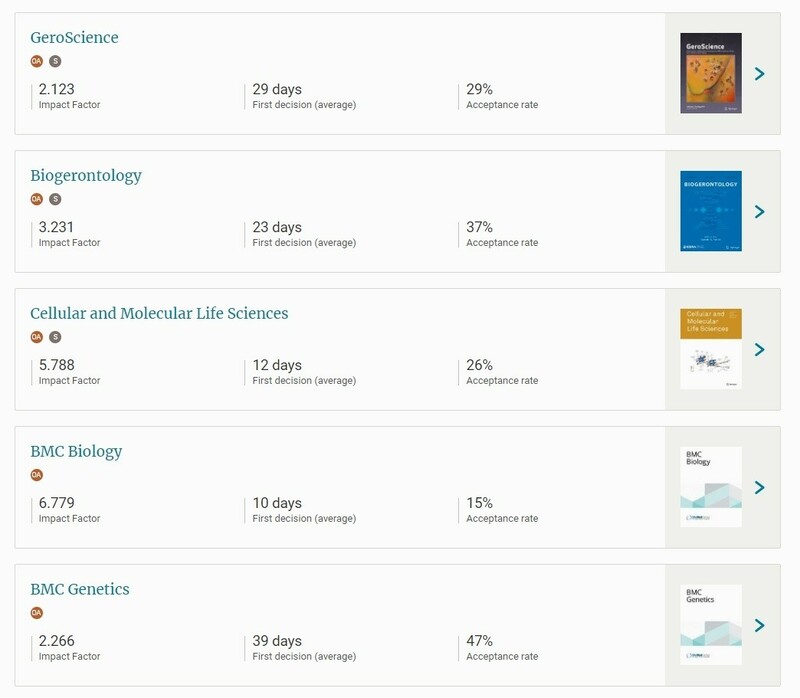 Moreover, the tool displays vital journal details to the scholars including publisher details, peer review process, confidence index (indicates similarity between matching keywords in the published articles across all journals indexed by DOAJ), and publication speed.